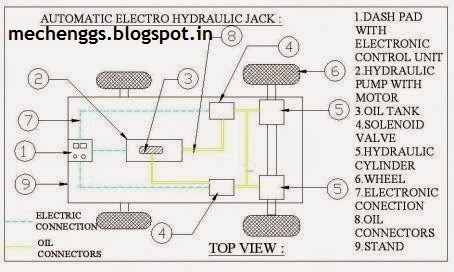 This project work titled “AUTOMATIC ELECTRO-HYDRAULIC JACK FOR LIGHT VEHICLE” has been conceived having studied the difficulty in lifting the any type of light vehicles. Our survey in the regard in several automobile garages, revealed the facts that mostly some difficult methods were adopted in lifting the vehicles for reconditioning. Now the project has mainly concentrated on this difficulty, and hence a suitable electronic control unit has been designed. Such that the vehicles can be lifted from the floor land without application of any impact force. By pressing the button in the dashboard, the electronic control unit activates the hydraulic jack automatically. The fabrication part of it has been considered with almost case for its simplicity and economy, such that this can be accommodated as one of the essential tools on automobile garages. This device the automatic electro-hydraulic jack for light vehicle garages has been developed to later the needs of small and medium automobile garages. In most of the garages the vehicles are lifted by using screw jack. This needs high man power and skilled labors. In order to avoid all such disadvantages, this automatic electro-hydraulic Jack has been designed in such a way that it can be used to lift the vehicle very smoothly without any impact force. The operation is made be simple that even any person can handled, by just pressing the button. The dash pad switch was activated at the time of any breakdown condition. The control signal is given to the solenoid valve, when the button is activated. The same time, the motor is started which is coupled with rotary hydraulic pump. The oil is suctioned from the oil tank and compressed oil goes to the solenoid valve. The solenoid valve is activated at the time of dash pad button “ON”. The compressed fluid (oil) goes to the hydraulic cylinder. The compressed oil pusses the hydraulic cylinder piston and move forward. The RAM is fixed at the end of the single acting hydraulic cylinder. The piston moves towards the ground and the ram is lifting the vehicle upwards. The solenoid valve is deactivated at the time of dash pad button “OFF”. The hydraulic cylinder fluid (oil) goes to the solenoid valve. Then the oil returns back to the oil tank, by the time of deactivating the solenoid valve. Thus the extra oil not required to maintain the oil level in the oil tank. The moving parts of this system are cooled by the oil itself used. Thus this project does not require any cooling arrangements. The loaded light vehicles can be easily. Maximum height up to 1.5 feet can be reached. 1. Initial cost is high. It is very much useful for Car Owners & Auto-garages. This automatic electro-hydraulic jack is used for lifting the vehicles.